It’s Popsicle Week! That magical week once a year where everybody (it really does seem like everybody!) 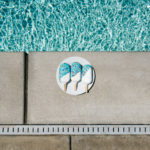 gathers around the pool to eat frozen on a stick goodness. I’m all about frozen pops, especially with it being as hot as it is, but since I’ve got camping on the brain, I’ve been thinking about how to have my pops (semi-frozen) and eat them too. Even though we have an awesome cooler, keeping popsicles frozen for days on end while camping just isn’t possible. So I made something the moment we got back from camp: a cake pop – not the kind that is cake crumbs mixed with frosting, nope this is straight up funfetti cake baked into a pop mold. 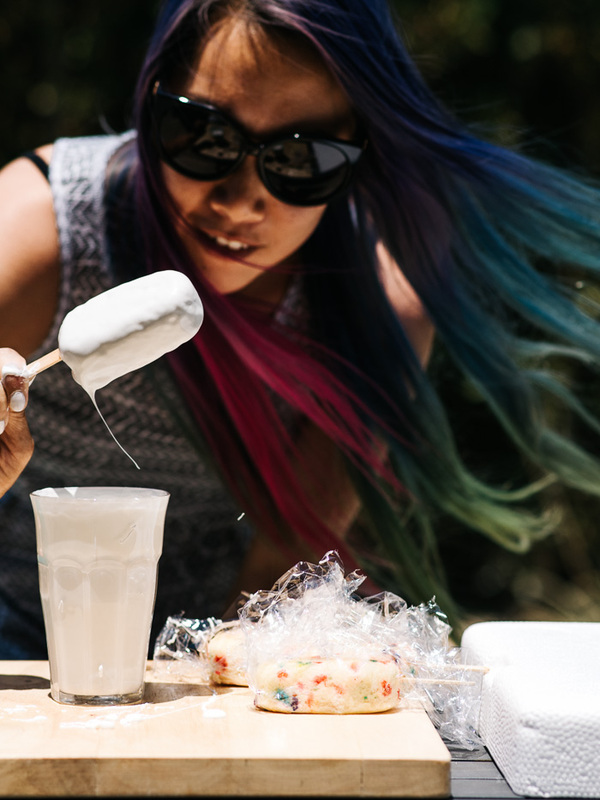 Pop them into the freezer so they’re ice cold and by the time you get to your campsite (or pool! ), they’re still ice cold, but easy to bite into. When they defrost a little you have a frozen cake treat – it’s not even remotely close to a frozen treat, but I have a thing for cold, cold cake, so I’m very, very happy with this situation. 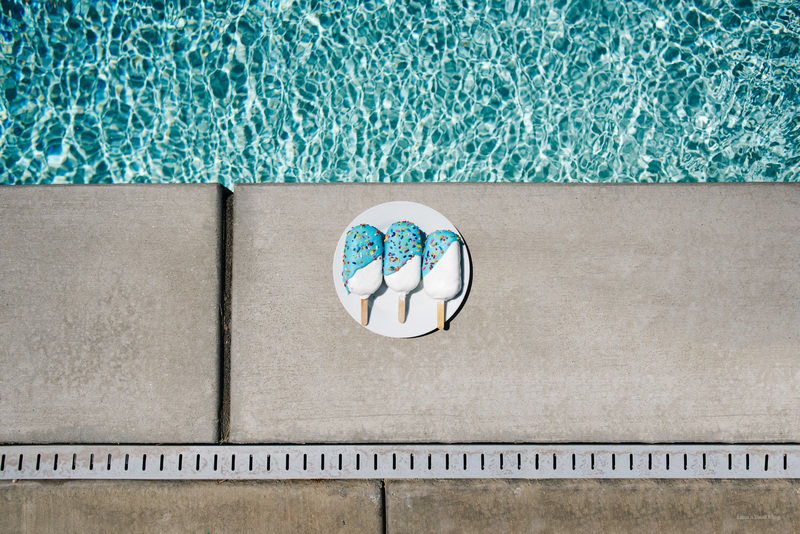 To be honest, at first I wanted to do a cake and ice cream pop, because cake and ice cream is up there with pie and ice cream, maybe even more? But in the end, the thought of my pops melting made me sad so I’m glad I went with all cake. If you’re not going camping, pop these into the fridge or freezer so you get a nice cold cake pop to bite into. I know most cakes are served at room temp, but the trashy part of me loves frozen store bought Sara Lee/McCains Deep n Delicious cake, so please, just do it! Also, these guys are enjoyable sans candy coating dip too, so if you’re a naked cake lover, they definitely work like that too. I used Molly’s funfetti cake recipe and trust me guys, it’s a winner – it reminds me of childhood in the best way possible. PS – Thanks Billy for being the best popsicle week host ever! Hop on over to see all other frozen creations on his site and if you want to see my contributions for 2015 and 2014, they’re here and here! 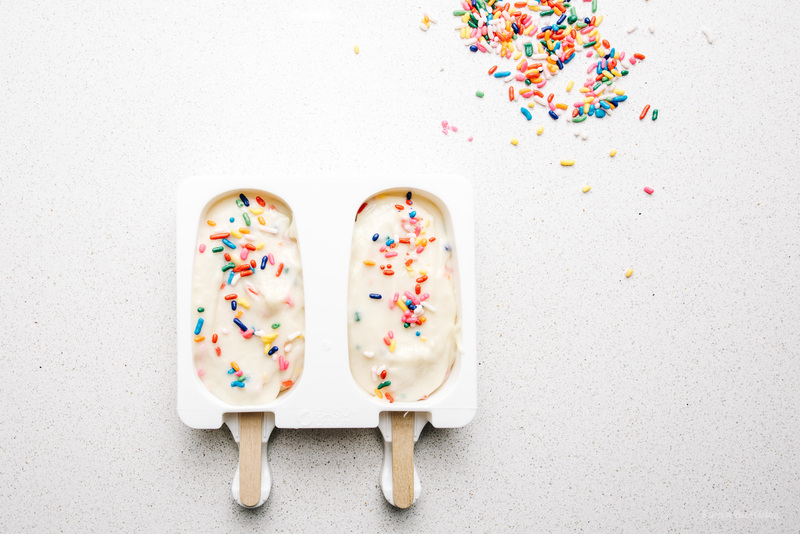 PPS – It’s hella hot here and Mike and I are kinda sort of patting ourselves on the back because we came up with pops that don’t melt. Photographing pops in a heatwave is definitely not recommended. In a bowl, cream together the butter and sugar until fluffy. Add the egg white, mixing well. Mix in the vanilla and oil until smooth. In another bowl, whisk together the flour, baking powder, and salt. Add the flour mix to the butter mix in three additions, alternating with the milk and ending on flour. 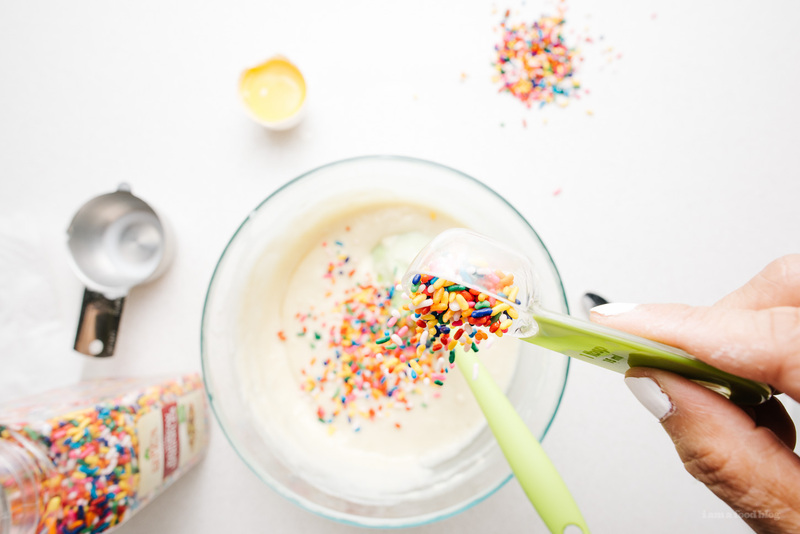 When smooth, gently fold in 2 tablespoons of rainbow sprikles. Spoon the batter into your cake pop molds, about 3/4 full. You will have a bit of batter leftover, I baked the extra in a small ramekin. Sprinkle on an extra bit of sprinkles. Bake, until a toothpick inserted into the center comes out clean, about 18-10 minutes. Let cool completely before removing from the molds. If decorating, melt the candy melts in a tall glass according to the instructions. Dip in the white and let set. Half dip into the blue, sprinkle on sprinkles and let set. Freeze if you’re taking them camping or you like frozen cake (like I do! ), or put in the fridge until deeply cold. Enjoy cold! Note: The original recipe calls for cake flour, but I needed a more sturdy cake to hold the sticks in so I went with all purpose. PS – If you’re looking for the molds, you can get them here. 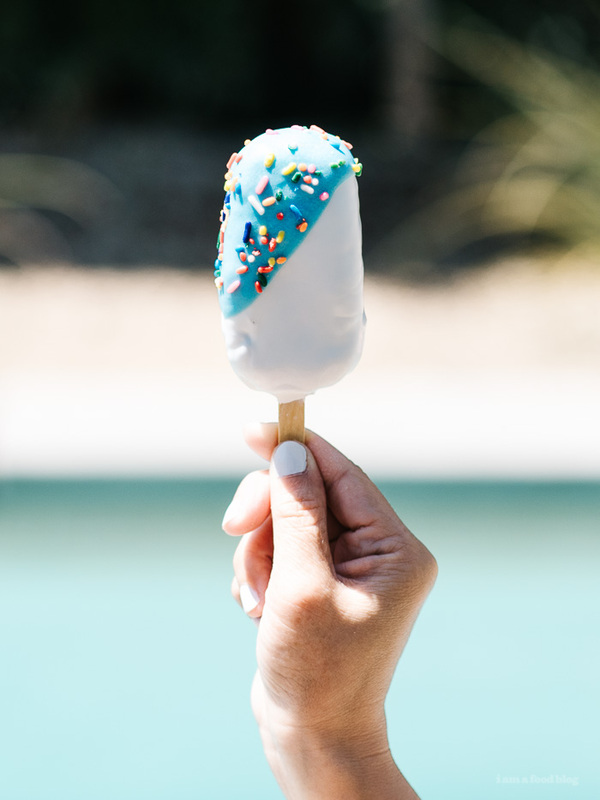 ohhh i just love these frozen cake pops and pffft, so not trashy to eat frozen store bought cake (or at least I hope it’s not ‘cuz I’m a fan!). 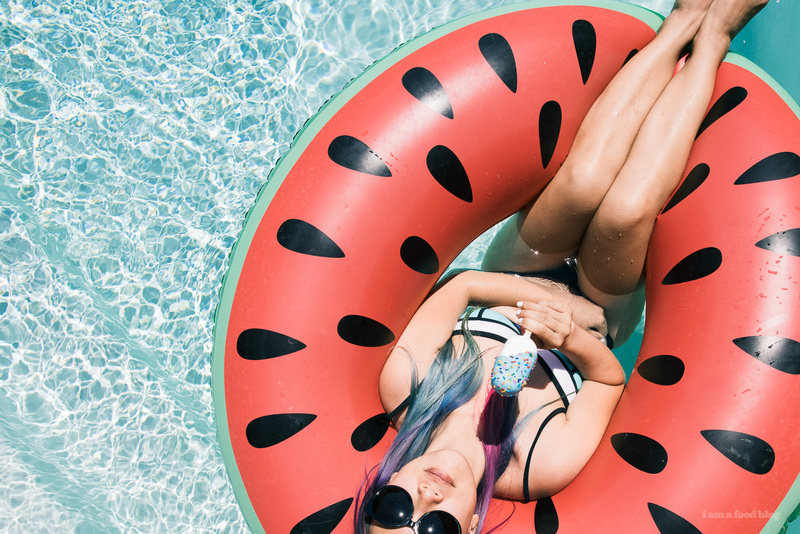 You and that cute watermelon floaty are summer goals, lady! ohhhh, that’s clever. everyone else was freaking out trying to snap their pops while you have plenty of awesome outdoor shots. love that state of zen you have going on in your watermelon floatie pic. These look so yummmm!! Where do you find molds like that? When I search for “cake pop colds”, only the round cake pop molds appear. Any suggestions? These turned out so great!! Whenever we make snickerdoodles we always freeze half the dough so freezing cake batter = down. Cute pics! Love the look of those pops too. Sad to have missed popsicle week this year, but next year I’ll be all over it! hi vincent, you can buy them here! After dipping into the candy melt . You lay it flat on the paper/plate whatsoever. So one side on the Popsicle will not nicely quoted ? that’s right, one side won’t be as smooth as the other, but if you’re concerned, you can set them up like regular cake pops where you push the popsicle stick into something so that it stands straight up while it’s setting.